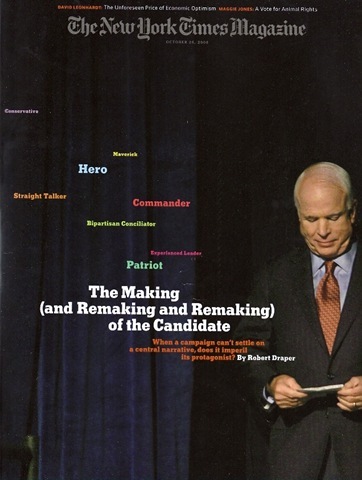 When reading Robert Draper’s cover article for the NY Times Sunday Magazine (Oct. 26, 2008), The Making (and Remaking and Remaking) of the Candidate) When a campaign can’t settle on a central narrative, does it imperil its protagonist? I couldn’t help think about how delivering clear and consistent messages is essential to the successful exercise leadership. Of course, many book and articles have been written on the combined subjects of leadership and communication but it’s very powerful to see it happen right in front of us. This is just one of the many very valuable lessons that we can learn by using the 2008 Presidential Campaign as a leadership learning lab. What campaigns peddle is not simply character but character as defined by story — a tale of opposing forces that in its telling will memorably establish what a given election is about. Unfortunately, none of these have really struck a chord with Americans and it can probably be argued that the shifting narratives have, in fact, had a detrimental effect on McCain’s ability to effectively tell his story. Coming from behind in the Presidential race, McCain has limited choices: hope that Obama will somehow slip up; change things in his own campaign or attack your opponent’s perceived weaknesses. Obama has been fairly steady and consistent which leaves McCain with just two options. John McCain’s biography has been the stuff of legend for nearly a decade. And yet Schmidt and his fellow strategists have had difficulty explaining how America will be better off for electing (as opposed to simply admiring) a stubborn patriot. 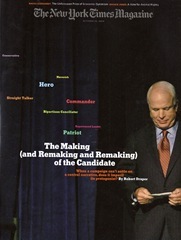 In seeking to do so, the McCain campaign has changed its narrative over and over. Sometimes with McCain’s initial resistance but always with his eventual approval, Schmidt has proffered a candidate who is variously a fighter, a conciliator, an experienced leader and a shake-’em-up rebel. “The trick is that all of these are McCain,” Matt McDonald, a senior adviser, told me. But in constantly alternating among story lines in order to respond to changing events and to gain traction with voters, the “true character” of a once-crisply-defined political figure has become increasingly murky. The trouble with experimenting with your own story is that it can leave people confused. At this pinnacle of politics and arguably world leadership, you have to have a consistent message about who you are and what you stand for and repeat it simply and clearly over and over again. Take a page from the playbook of the world’s most recognized and valuable brands like Coca Cola and McDonalds and not tinker too much with the product for fear of diluting the brand. Of course, this equally applies at every level of leadership. In the period before the campaign’s decision earlier this month to wage an all-out assault on Obama’s character as the next narrative tactic, McCain was signaling to aides that it was important to run an honorable campaign. People are hurting now, McCain said to his convention planners as Hurricane Gustav whirled toward the Gulf Coast. It’s a shame we have to have a convention at all. But because we have to do this, tone it down. No balloons, nothing over the top. When his media team suggested running ads that highlighted Obama’s connection with the Rev. Jeremiah Wright, McCain reminded them that he pledged months earlier not to exploit the matter, and John McCain was not about to go back on his word. In such moments, the man who renounced negative ads during the 2000 campaign because he wanted (as he told his aghast advisers back then) “to run a campaign my daughter can be proud of” has been thoroughly recognizable. But that John McCain had lost. Of the noble but perhaps naïve decision in 2000 to unilaterally take down his attack ads, Rick Davis would vow: “That’s not gonna happen a second time. I mean, the old dog can learn a few new tricks.” And yet on this landscape of new tricks — calling your opponent a liar; allowing your running mate to imply that the opponent might prefer terrorists over Americans — McCain sometimes seemed to be running against not only Barack Obama but an earlier version of himself. There’s a danger when a leader doesn’t deliver a consistent message over time, especially experienced leaders with track records. The importance of words and actions matching each other must not be underestimated. If a leader chooses to significantly change positions or act in contradiction with previous statements, then they have to get out ahead of the change with a clear, simple and consistent message with the reason. Failure to do so opens up the opportunity to question character, can lead to more confusion and can ultimately undermine some of the leadership characteristics that attracted followers in the first place. If the leader is consistently self serving in his/her actions, followers perceptions will be more favorable than if the leader acts inconsistently. Trust, reputation and credibility are all anchored by the concept of behavior predictability. That is, we believe followers are better prepared to respond to a consistently self serving leader than one who is politically inconsistent. No matter what political party you might be affiliated with, Draper’s Sunday NY Times Magazine article is instructive about how leaders need to find and deliver their clear, simple and authentic message in order to attract and retain followers. There are valuable lessons for those who exercise leadership at any level. Tagged with communication, New York Times, Senator John McCain.